My daughter was friend of the day in school earlier this week. I spent the entire day helping out in her classroom. (Still covered in green paint from the turtle project!) Anyway, since they're discussing the letter "T" this week we made turkey cookies for snacktime. Found the idea on Betty Crocker. We made homemade sugar cookies instead of using a mix. So cute! You should add this to The Snail's Trail Handmade Holidays. I can't wait to make this with the kids. What a fun project! You all did an awesome job on it! 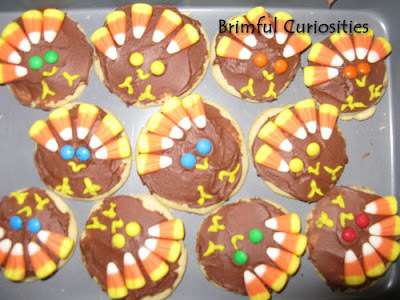 I should definitely make these with my kids! Those are so cute! I bet they were fun to make. Want! They're adorable and look easy enough to make even I can do it! Those cookies are so stinking cute!